Jim’s family has a number of recipes that are pulled out every year just for Christmastime. We look forward to tins and plates full of these mouthwatering goodies when we visit for the holidays. This year we will not be joining Jim’s family out East, so it is up to us to provide the tins and plates full of cherished family nibbles in our own house. 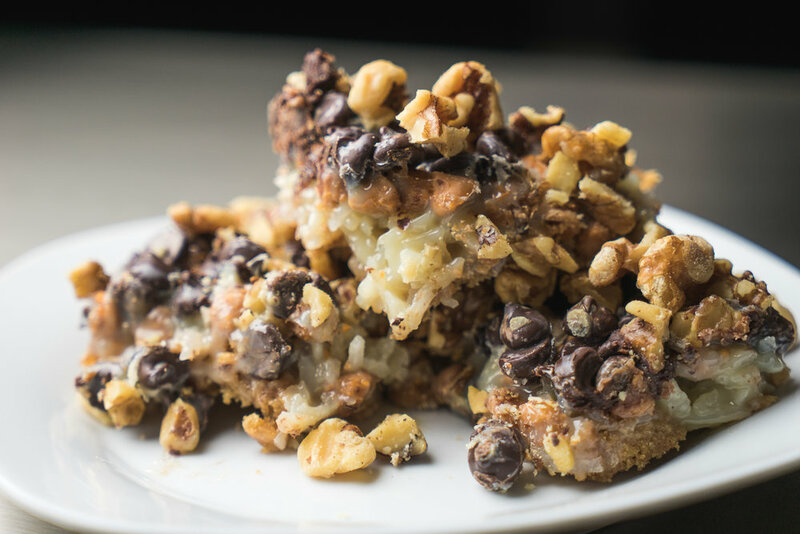 One that always stands out and makes an annual appearance is Jim’s mothers seven layer bars. If we are fortunate, we will see this gem in a Christmas care package sent to us this year. But if not, Jim’s mother has kindly shared her recipe with me so that I may create a little piece of home for Jim here on the prairie. This bar is incredibly sweet, so a little bite goes a long way but be warned! Once you have a taste you will not be able to stop yourself from wandering back to the kitchen for one more little square and a tall glass of milk to wash all that sweetness down! It is very important to allow the bars to fully cool before you try to slice into them. They will be quite soft if you slice them too soon. You want it be a bar, not a cake! 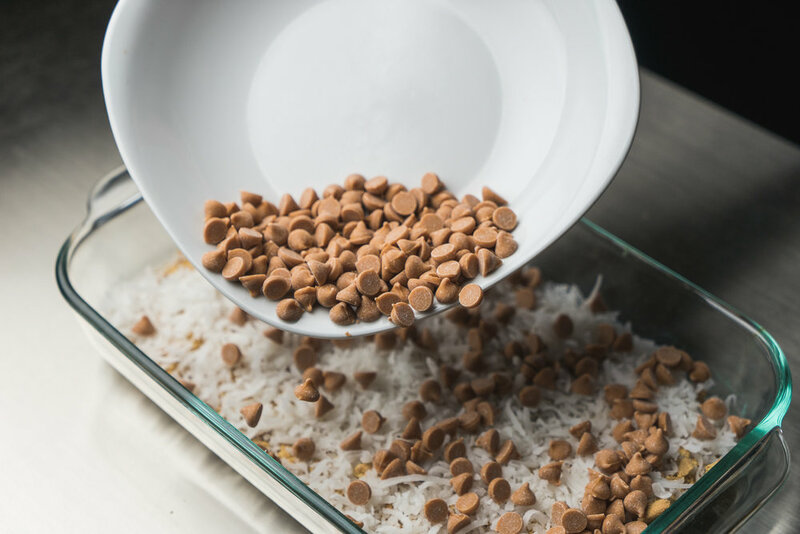 If you want to tone down the sweet a bit, you may use unsweetened coconut flakes in the recipe or adjust the ratio of chocolate and butterscotch chips. Butterscotch is quite sweet, so adding more chocolate than butterscotch chips will tone down the sweet a little. 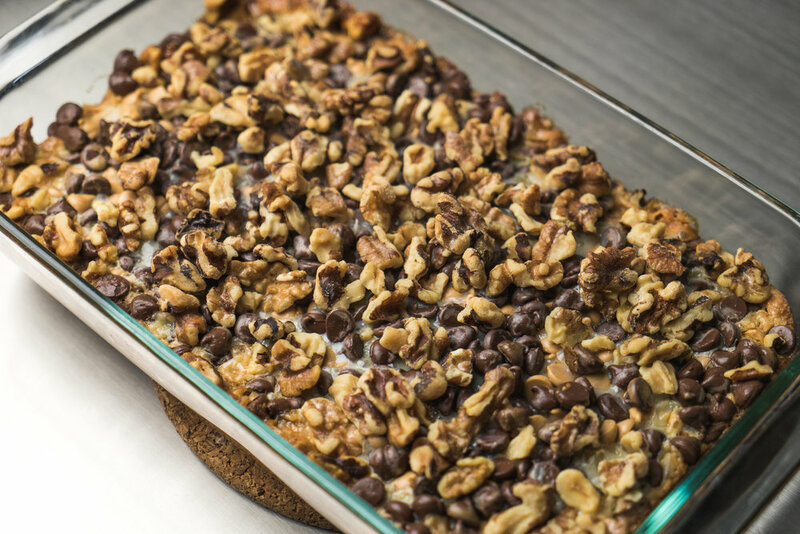 These are fantastic for giving since a small bar will satisfy your sweet tooth so make these and share with someone who could use a little sweet in their life! If you have the outdoor space (an open porch) you can cool these bars there to save yourself the refrigerator space. Finally a use for all of that cold, blustery weather!